Referee Maurice Deegan shows Lee Keegan a black card. THE MAYO COUNTY Board’s public relations officer has lashed out at media organisations for attempting “to blacken Lee Keegan’s name” during the build-up to the All-Ireland final replay. Keegan’s tussle with Dublin forward Diarmuid Connolly attracted considerable attention from the media and supporters before, during and after both All-Ireland finals. 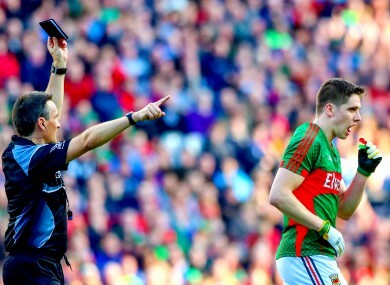 The Mayo defender, who was later crowned Footballer of the Year, was shown a black card in the All-Ireland final replay for a challenge on Connolly as Dublin retained their All-Ireland crown. Mayo PRO Paul Cunnane has taken issue with the media’s approach to the Westport man in the county convention report. While largely full of praise for their efforts, Cunane says he felt journalists “took the bait” when it came to their portrayal of Keegan ahead of the 1 October replay. “In the lead-up to the All-Ireland final replay there was a well-orchestrated media campaign to blacken Lee Keegan’s name and I would be disappointed that many media outlets chose to take the bait in the lead-up to the replay,” Cunnane wrote in the report. “Lee Keegan has just won his fourth All-Star as well as being named GAA/GPA Footballer of the Year. “This recognition was due to his excellent displays throughout the national league and championship. “He is one of the finest footballers the county has ever produced. “To see him depicted in this way before the biggest game of his career was very unjust. Email “Mayo official condemns 'media campaign to blacken Lee Keegan's name'”. Feedback on “Mayo official condemns 'media campaign to blacken Lee Keegan's name'”.